Immigrants on 457 visas in Australia having worked with the same employer for a period of two years are eligible for this pathway to get the Australia PR. 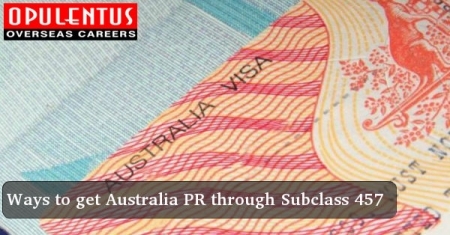 The employer needs to agree to sponsor the applicant for the Australia PR. It is mandatory for the employer to submit a valid nomination to the Immigration authorities. You also need to meet the skills required, qualifications of the job and sufficient English language requirements for the position. Migrants with 457 visas who presently do not have an employer agreeing to sponsor them to get PR are eligible here. It has the visa subclasses of 189, 190, and 489. In this stream, the candidates can submit their applications independently, or also with a sponsor from the Territory/ State government. The occupation applied must be listed among the Skilled Occupations. The applicants must first file an EOI. They can go for applying on receiving an invitation. They are given 60 days to file applications for PR on receiving the invitation. This pathway is meant for 457 visa holders who have a committed and authentic relationship presently with an Australian PR holder /citizen. This visa in the subclasses 820 and 801 allows the partner or spouse to qualify for processing his/her application. The marriage must be valid in Australian law. The time of at least 12 months is required in this de facto relationship. To find out if you are eligible to immigrate to Australia permanently, fill out a free evaluation form or contact us at [email protected] or call us 1800 103 1555. One of our experts will meet your expectations and provide answers to queries.